If you are reading this review, you likely are well versed in the broader Marvel Cinematic Universe. The loose stitching that has framed an unprecedented 17-movie win streak is now the stuff of pop culture legend. Constructing a narrative within a mythology boasting continuity now several hundred characters deep is no easy task, and somehow impossibly, Marvel Studios has done so defying expectations at every turn. If you are here, it is likely you are mostly curious if the studio’s attempt at creating a superhero flick written by a black writer, directed by a black director, and starring a black actor is a success. Bizarrely for a post-year-2000 world, there has almost never been a major feature film about a superhero where the lead character/hero was black. The only other instance where one can find a direct parallel is the 1997 Todd McFarlane comic adaptation Spawn (though a brilliant comic, a movie best forgotten). If you are one of those curious stumbling in to know if Black Panther is as solid an adaptation as the other MCU movies, the answer is a resounding yes. 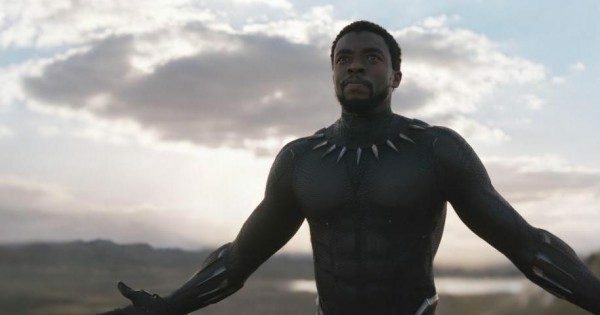 The Black Panther film itself famously long in gestation before finally being green-lit by Marvel Studios, finally kicked into high gear after Chadwick Boseman was cast as the titular character also known as T’Challa and he appeared in the massive hit Captain America: Civil War. Fruitvale Station and Creed director Ryan Coogler brought this film to life co-writing with Joe Robert Cole. 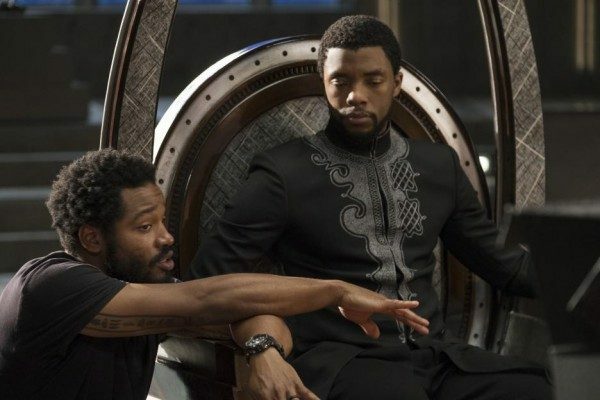 Coogler and the famously nicknamed “House of Ideas” Marvel Studios put together an all-star cast of the best and brightest of black actors and actresses both up and coming and long-established. Joining Boseman for the bombastic spectacle is Michael B. Jordan (Fruitvale Station), Danai Gurira (The Walking Dead), Lupita Nyong’o (12 Years a Slave), Daniel Kaluuya (Get Out), Letitia Wright (Urban Hymn), Angela Bassett (Strange Days), Winston Duke (Modern Family) and Forest Whitaker (The Last King of Scotland). Martin Freeman (The Hobbit) and Andy Serkis (just about anything you’ve ever seen that had an incredible motion capture performance) also star in well-placed supporting roles. Read that cast list over one more time. That is an incredible roster of top-notch talent. Just putting that group together for one film deserves accolades. While conventional wisdom would expect some form of world-threatening destruction in a superhero film, Black Panther wisely eschews the trappings of tropes for a deeper pondering unlike anything yet seen in this genre. This film has a ghostly thread underpinning all that the story unfurls: the unmitigated evil of African colonization and the continued plight of repressed black people worldwide. Yes, this hangs over the film as a super subtle subtext, connecting the failures of certain characters early on with the vengeful dreams of antagonist Michael B. Jordan’s Erik Killmonger. Killmonger ranks along with Tom Hiddleston’s Loki as the MCU’s best-defined villains, and by film’s end, his character’s drive, ambitions and inner psychological tangles are all laid bare. The other side of the story is the lovingly rendered and idealized, demarcated fictional nation of Wakanda. Isolated wholly from the world by design—the insanely technologically skilled nation has their whole territory shielded by a cloaking device—Wakanda has developed almost perfectly into a country that simultaneously has found harmony with its rural roots and a progressive metropolitan center. It is implied heavily, though never outwardly stated, that this chosen path of hiding in plain sight is why Wakanda has quietly (nay, silently) become one of the world’s wealthiest and most content countries. Through clever dialog it is apparent that the populous is divided between those that favor continuing this isolation, those that wish to help the world and those that wish to use the country’s accumulated power to liberate those unfairly oppressed. No two citizens seem to stand in the same place on this issue. It is this tug of war between the concern for oppressed, disadvantaged people worldwide and whether Wakanda should at all get involved in helping them that is the soul of the story. Like any good movement in U.S. history, it all starts with a leader. Wakanda’s success comes down to the chance arrival of a meteorite filled with the curious element vibranium. Centuries ago, the first of the Black Panther leaders used the element and won the respect of the five disparate tribes of Wakanda, uniting the nation and setting its path towards progress and protection. It is shortly after the events of Captain America: Civil War where T’Challa’s story picks up with him heading home for his coronation ceremony. He will be king following his father King T’Chaka’s passing at the hands of Zemo when he bombed the United Nations. Like with CA:CW, Boseman plays the Black Panther with a detached grace and world-weary sadness. It is a stunning portrayal and one that lacks the overtly masculine pandering action heroes are often cookie-cutter modeled into. Along with Okoye (Gurira) the head of Wakanda’s elite, all-female fighting force the Dora Milaje, he picks up the luminous Nakia (Nyong’o) his ex-girlfriend on the way back to his homeland. There we meet his bratty but brilliant sister Shuri (Wright), dignified mother Ramonda (Bassett) and lifelong friend W’Kabi (Kaluuya). With little time to find his feet or grieve, T’Challa must participate in an elaborate ritual at Warrior Falls, a series of controlled waterfalls looking over a giant ravine. There, Zuri (Whitaker), the country’s spiritual leader, guides the event according to tradition. There, any challenger from one of the five major tribes can call for combat claiming the right to rule Wakanda. It is after this event where Killmonger is introduced and Ulysses Klaue (played with devilish glee by Andy Serkis) a villainous arms deal first explored in Avengers: Age of Ultron returns. The movie mutates as it rolls on, shifting between a sleek James Bond-esque spy-groove (minus all the womanizing) and a complex dissection of old-style tribal politics. Killmonger’s plan may not be sophisticated, but his determination and skill is beyond formidable. Like gold and diamonds through millennia of colonial madness, Wakanda’s underground mountain of vibranium drives good men mad. Desperate to use the power it can render to shape the world, it tears at the foundation of what people regard their homeland and friendships to be. It is this dilemma that will keep you riveted until the movie’s final frame. 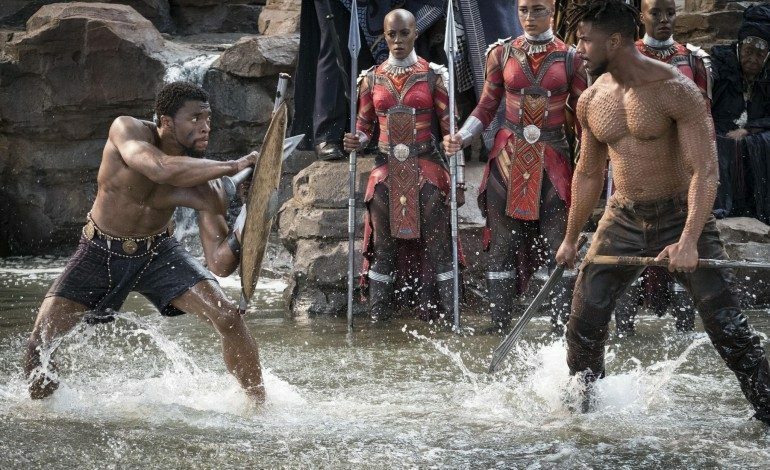 Along with the wonderful acting and storytelling, Black Panther soars in regards to costumes, production design and soundtrack. The costume work in this movie is some of the bravest, most artful choices in any film of recent memory. Oscar worthy to say the least, Ruth E. Carter leads the effort and finds the perfect aesthetic for each of the characters and/or tribes. Each character is instantly unforgettable, the costumes drawing on a wide array of real-life African fashion. 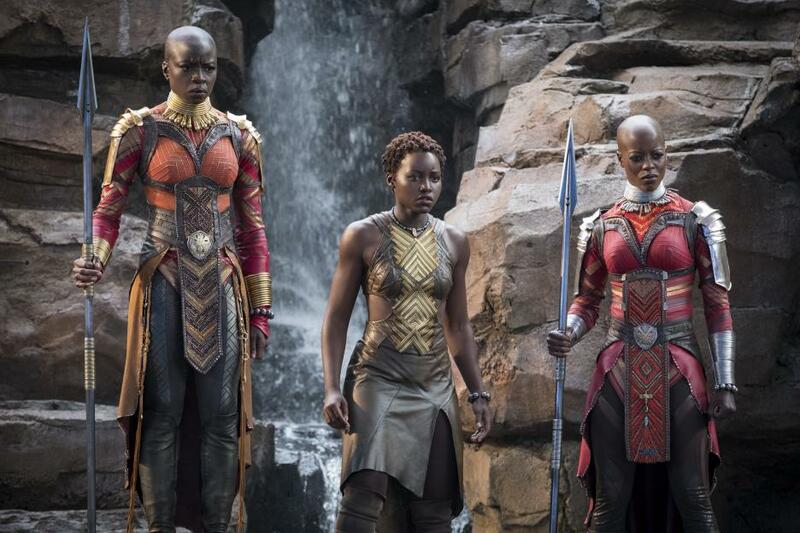 Wakanda itself is immaculately rendered under the careful hand of Production Designer Hannah Beachler. Each and every part of Wakanda looks like some genius illustration from high fantasy, only believably real looking. The score also is a perfect mix of tribal percussion and modern-day crème-de-la-crème hip-hop (the former led by Dave Jordan, the latter curated by superstar rapper Kendrick Lamar). No doubt about it. Marvel has done it again. The bold projections you have heard will likely be far surpassed. This will be a juggernaut success. Just like Wonder Woman did last year, this movie will steam roller everything in its path. It also intelligently speaks to a massive void in popular cinema: a lack of quality representation and opportunity in movies for black talent. Credible, fun and rewarding, Black Panther chapter 18 in the Marvel Cinematic Universe, is a must-see film.